We’re looking for volunteers to help with our Biographical Records Project to support the work of the Shackleton Project in the Archives and the Antarctic Cataloguing Project in the Museum. This is a great opportunity for anyone interested in learning more about the people associated with polar exploration. Project Aim: The project brings together existing research into people and expeditions and places the information on Modes, our collections database. 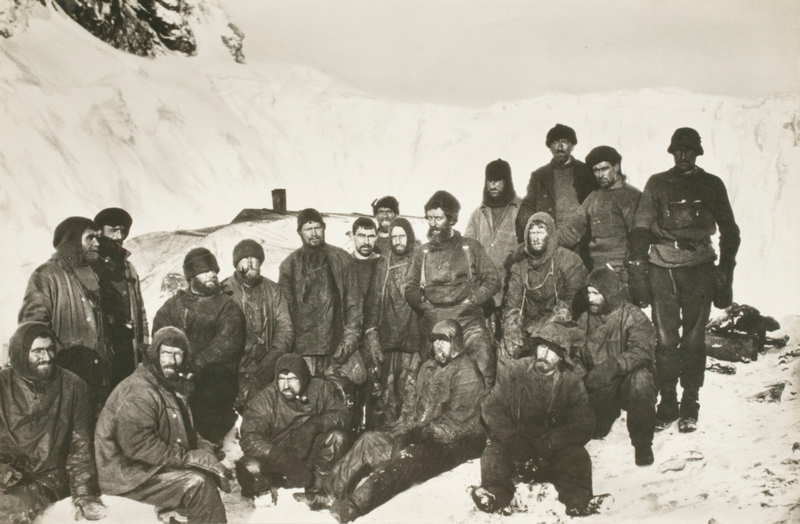 Background: Our biographical records provide a rich source of information on the people who have lived and worked in the polar regions, and the people contacted to them. From explorers to families, to newspaper editors and manufacturers, the biographies provide a wonderful insight into the lives of these people. Over the years we have amassed a wealth of knowledge, and the time has come to bring this together on our collections database. This will enable us to enhance vistor experience in the museum and online via our website, and will assist in collections management in the Archives, Museum and Picture Library. The Work: This is a computer-based project, with some additional research in the Library collections. The work will involve transferring information from a variety of mediums, predominantly Microsoft Word or Excel documents, plus some paper records, into a template on our Modes database. Full training on completing the template will be provided. Volunteers will be given a set of people connected to a particular expedition. Please contact Naomi Boneham (archives@spri.cam.ac.uk) or Greta Bertram (museum@spri.cam.ac.uk) if you’re interested in taking part in this project or want to find out more. Work is continuing apace on the Antarctic Cataloguing Project, with over 600 objects examined, described and condition assessed. Working by object type (which makes life much easier in terms of accessing the objects in the store, and facilitates description and condition assessment as you know what to look out for), Sophie, Christina and I have now worked our way through all of the goggles, medals, boots, clothing, snowshoes, crampons and skis housed in our main store (this excludes those items in the auxiliary store and in the gallery, which we will deal with at a later date). Having spent two-three months working on the clothing, which included socks and slippers, mittens and gloves, hats and scarves, trousers, jumpers and endless numbers of anoraks, it made a very pleasant change this week to whizz through the entire collection of geological specimens in a single day. Not being a geologist, there’s very little I can say about a rock, so describing them was really rather easy and all I had to do was take a few measurements! 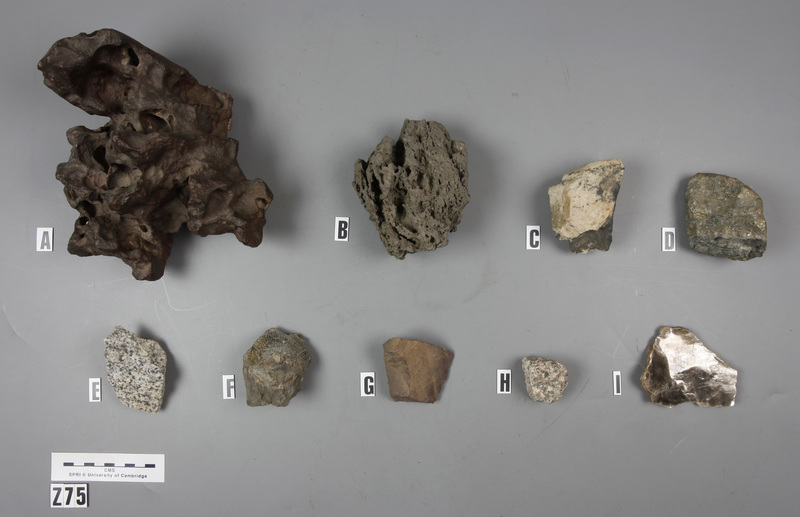 Thankfully, many of the geological specimens had already been identified and this was recorded in the catalogue, but there were still quite a few with the really helpful description of ‘rock’ – although occasionally there was a bit more detail, like ‘small rock’. The great thing about SPRI is that you are surrounded by people who know about polar things, so there’s usually someone in the building with the required knowledge. So we turned to SPRI’s resident geologist, Dr Peter Clarkson, who spent 22 years working as a geologist with the British Antarctic Survey, to help us out. Unfortunately, with such small samples and so little contextual information for the rocks identified as needing the ‘PCT’ (Peter Clarkson Treatment), we weren’t able to get an identification for everything. However, Peter was extremely helpful and filled in a lot of gaps, even if it did mean pointing out that some of the samples were of very doubtful Antarctic provenance and that others were really nothing special and it wasn’t quite clear why they were even in the collection! And, having run everything by a geologist, we’re almost certain that we’ve got identifications for all the things that we’re ever likely to be able to identify. 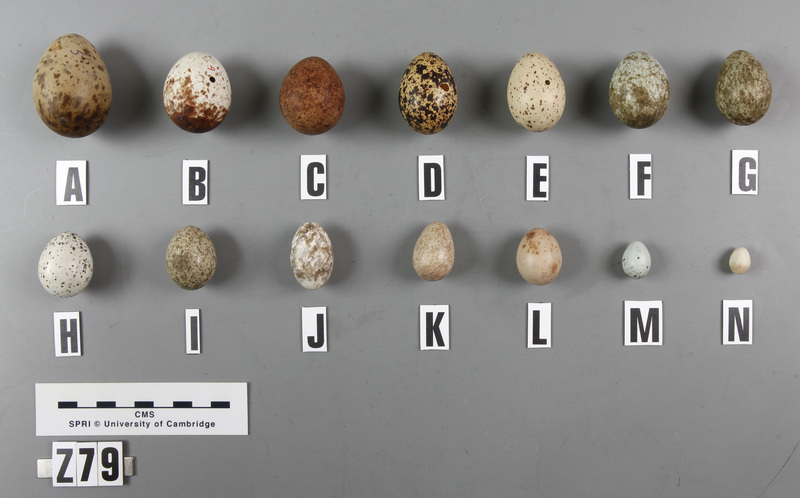 We then moved onto to natural history specimens, which largely consists of eggs (also pleasingly quick to examine). But it’s not just penguin eggs! I always forget that, for the purposes of the Antarctic Cataloguing Project, ‘the Antarctic’ doesn’t just refer to the continent of Antarctica, but also includes Antarctic and sub-Antarctic islands, where wildlife is more diverse. However, I think that many of these eggs may also be of doubtful Antarctic provenance (for example, a group thirteen eggs collected by Edward Adrian Wilson, doctor and artist on Scott’s British Antarctic Expedition 1910-13 which may well have been collected in the UK), but unfortunately we don’t currently have a resident ornithological expert – so if anyone’s good at identifying birds’ eggs, we’ve got a good selection! 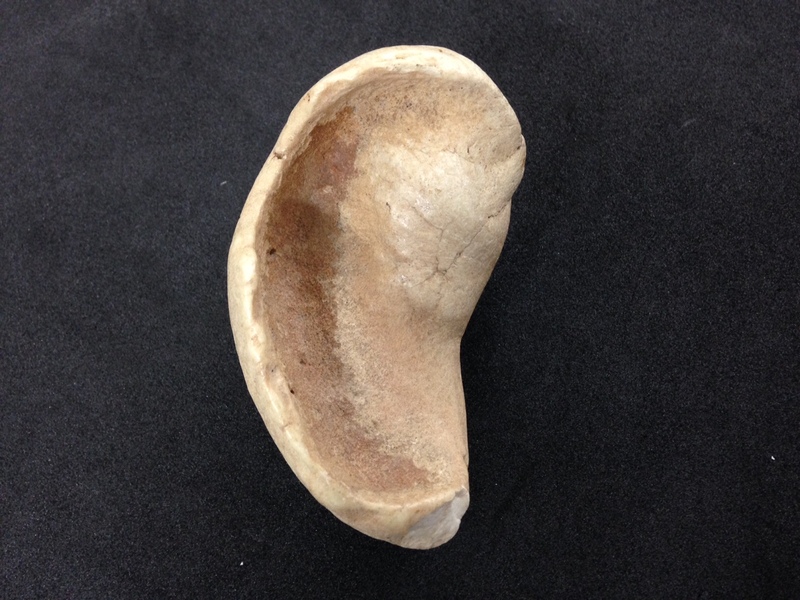 And I really shouldn’t forget to mention that we have a bone from a sperm whale’s ear – just because. The final structure of our template record (field headings only). It’s been a long time coming but we have finally (or very nearly almost) finalised our standardised record template which will work for all of the objects in the museum’s collections – be they Arctic, Antarctic, polar general or art works. 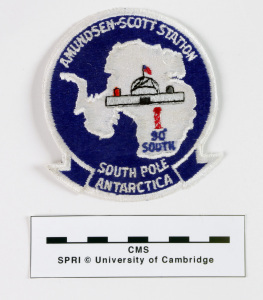 This has been an enormous part of the Antarctic Cataloguing Project so far – and perhaps a much bigger and more-time consuming task than I’d first expected – but I’m absolutely certain that it’s been worthwhile. To accompany the template we’ve also produced some really detailed guidelines on what information should be recorded where and in what format, how and when to repeat individual fields or groups of fields, and when to use termlists. As well as setting up termlists for all the fields where we want to use controlled terminology, we’ve made huge advances in our use of the functionality of Modes (our collections management database) in order to set up termlists which hyperlink to biographical records for people, organisations and expeditions. These records still need populating – an ongoing task that we’ll be working on for quite a while – but everything is now in place. The great thing is that these are resources that can be shared by the museum, archive and picture library catalogues, and we won’t need to repeat biographical information in individual object/archive/photographic records. 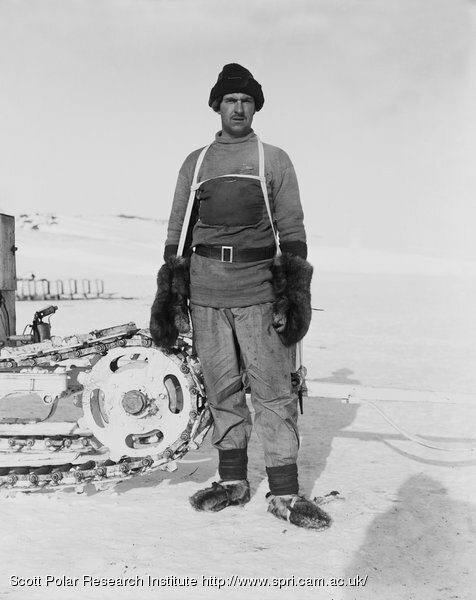 And ultimately, if all goes according to plan, this biographical information will become available as part of the Antarctic online catalogue, whereby clicking on the name of person or expedition will take you to a page about them. After a wave of terror (what if it all goes wrong?) and a very deep breath, I’ve now started reformatting the Antarctic records to match the new template. Unfortunately, because of the inconsistencies in the structure of the existing records, it isn’t possible to map records from the old format to the new so it has to be done by hand. However, I don’t mind doing it. In fact, reformatting records makes me very very happy! And it gives me a chance to familiarise myself with the information in the records and to tidy up some of the data where necessary. The plan is that whenever I add a new physical description to an Antarctic object record following the object study/condition assessment, I’ll reformat the record – so this will obviously be an ongoing process throughout the two years of the project. And I really hope that somehow we’ll find a way to reformat all of the other records in the database that are outside the scope of the project (i.e. everything that isn’t Antarctic). Although it’s going to be a slow process, the benefits will be enormous. A standard record format will make it much easier to search our collections and will help us manage information about the objects and things that happen to them, such as keeping track of research visits, conditions checks, exhibitions and loans. It will also help with the creation of the online catalogue – the current differing structures of records makes writing the code for the web catalogue a challenge. And, although perhaps not so important in the grand scheme of things but nevertheless very important to me, the records will all look the same and will be a thing of beauty! I can’t wait! 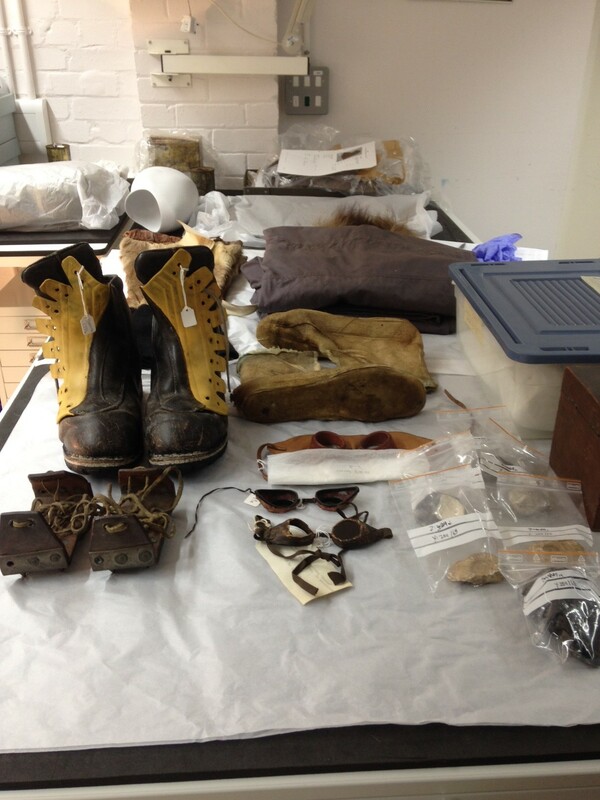 Nearly three months into the Antarctic Cataloguing Project and I nearly feel like I’m ready to get going properly. As well as continuing to work on our gold standard object catalogue record (a much bigger undertaking than I ever imagined! ), this week we’ve been trialling the object study side of things. There are three elements to this: describing and measuring the objects (me), conditioning assessing them (Sophie and Christina, our conservators), and photographing them (Chris and Tom, two very skilled photographers). As ever, it’s about figuring out what the process is – who needs to do what and when so that we can maximise efficiency and minimise the amount of handling of each object. For the sake of the trial phase, we’ve been looking at a representative selection of objects which vary in shape, size, material, age etc. in the hope that this will help us understand and think through some of the issues that different types of objects will present. So we’ve looked at goggles, fossils, penguin eggs, leggings made of reindeer fur, trousers and anorak, boots and liners, a knitted balaclava, a pair of skis, snowshoes, crampons, scientific equipment and a dog harness. My task is to produce a detailed physical description of each object – what it looks like, what it’s made from, any marks or inscriptions, how big it is etc. Looking at the object and making notes and sketches is pretty easy; the difficult part comes when trying to translate what you’ve seen into a succinct description – especially as I feel that I’m lacking the necessary vocabulary most of the time to describe what I’ve seen. It’s particularly difficult when you have no idea what the object is (as with this ‘surveying instrument’ Y: 2005/9/4). With advice from Sophie and Christina I’ve also been noting down anything we might need to take into account when it comes to photographing the objects, such as how we might position them or whether they can be photographed on a mannequin etc. Y: 2005/9/4. 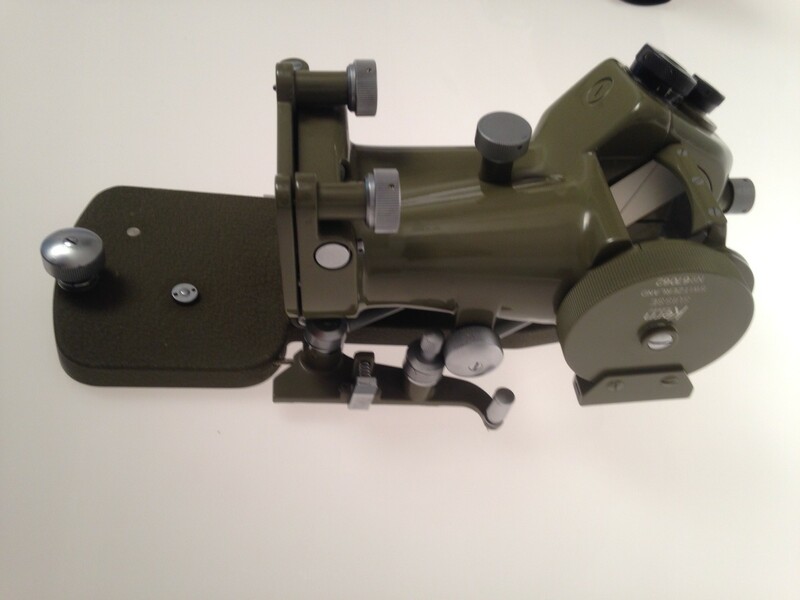 A ‘prismatic surveying instrument’ made by Kern & Co. of Aarau, Switzerland. While I’ve been doing this, Sophie and Christina have been carrying out a condition assessment of each object – recording the category of the object, the materials and the types of damage, and rating it for stability, need for treatment, need for repackaging, and overall condition. For me, it’s great to be working with them as they’re far more knowledgeable than I am, especially about materials, and it’s always good to have an extra pair of eyes. A few days later, our two photographers came to the stores to have a go at photographing some of the objects. 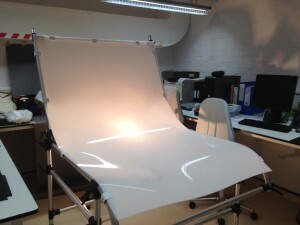 They brought along an amazing adjustable flexible table-top background (a thing of wonder!) which we just about managed to squeeze into the store (note for next time is that we can use the smaller table inside the store but are better off setting the bigger one up in a different space). This was a chance for them to see some of the material they’ll be working with, to think about where we’ll be able to take photos, what sort of background we want, and just to get a feel for how it’s all going to work. It was a great success and the pictures looked fantastic! (I should point out that all photos in this post were taken by me and, as such, are definitely not fantastic). While it’s been good to work on a range of objects, we’re all agreed that the object study­–condition assessment–photography process will be a lot simpler, smoother and quicker if we work by object type (which is what we’re planning to do from now on). Many of the objects are stored by type, so it makes them a lot easier to access. I plan to do some preliminary research on each type of object (e.g. goggles) before we even look at them so that I’m aware of the key points in goggle design and the things I need to look out for and so that I have the necessary vocabulary to describe them (is it a nose piece, a nose wire, a bridge?). Although the condition assessing is about judging against a fixed set of criteria, rather than in relation to the condition of other objects, I think it will be easier for Sophie and Christina to work on the same types of objects rather than jumping from goggles to skis to boots. It will also be quicker for Chris and Tom to photography objects of the same size as they won’t need to keep changing lenses and positions of lights, and the ease of access to the objects should mean that we can get a flow of getting objects out, photographing them and putting them away. Posted in Antarctic Cataloguing Project | Comments Off on It’s object time!